Gold was first discovered in eastern Oregon in 1861 in Griffin Gulch in the Baker district, Baker County. The town of Auburn was soon established as the first settlement and base for exploration. By about 1870 the richest placers were exhausted, but quartz lodes were discovered and developed, although slowly, and by 1900 were substantially productive in the Cracker Creek, Cornucopia, and Sumpter districts. As placer production decreased, Auburn declined, and Baker became the most important town in the county. Production data for Baker County before 1880 were not found. From 1880 to 1899, the county produced $8,958,073 (about 434,850 ounces) in gold. From 1904 through 1957, it produced 747,548 ounces of lode gold, 402,490 ounces of placer gold, and 11,626 ounces unidentified as to source. Total recorded gold production through 1959 was about 1,596,500 ounces; from 1954 through 1959 only a few hundred ounces was produced. Placer mining revived after 1912, and after World War II it was more productive than lode mining. Most of the county's gold production in recent years was from the Sumpter district placer mines, which were closed in 1955. BAKER DISTRICT: Production in the Baker district has been chiefly from the placers in Griffin Gulch but this was in the early years and was unrecorded. After 1900 more than half of the gold produced in the district came from lode mines. Production of gold from 1906 through 1959 was 19,825 ounces from lode mines, 10,890 ounces from placers, and 5,437 ounces undifferentiated--a total of 36,152 ounces. CONNOR CREEK DISTRICT: The Conner Creek district is along the west drainage of the Snake River between lat 44021' and 44044' N. and long 11703' and 117018' W. Placer mining began in this district in the 1860's along Conner Creek, and in 1871 lode gold was discovered at Conner Creek mine. After an estimated maximum production of $2 million in gold, the mine was closed in 1910 and was reopened only briefly in 1915-18. Small amounts of placer gold were produced from the district until 1942. From that time through 1959 there was virtually no production. The district produced about 97,000 ounces of lode gold and about 6,100 ounces of placer gold through 1959. CORNUCOPIA DISTRICT: The Cornucopia district, between lat 44057' and 45005' N. and long 117000' and 117015' W., reported very little activity until 1880-85. Its gold production to 1903 was valued at $1,008,000 (Oregon Department of Geology and Mineral Industries, 1939, p. 25). Production was fairly steady from 1903 through 1941, but it was only a few ounces from 1942 through 1959. Recorded production from 1907 through 1959 was 255,698 ounces of lode gold, 2,441 ounces of placer gold, and 5,800 ounces undifferentiated as to origin. CRACKER CREEK DISTRICT: The Cracker Creek district is between lat 44048' and 4454' N. and long 11803' and 118017' W., north of Sumpter. The most important lode in this district and in Oregon, the North Pole-Columbia, was discovered in 1887, and it produced about $9 million in gold (Oregon Dept. Geology and Mineral Industries, 1939, p. 34). From 1907 through 1959 a total of 189,389 ounces of gold was recorded from the district. EAGLE CREEK DISTRICT: The Eagle Creek district is between lat 44049' and 45005' N. and long 117000' and 117045' W., in the southern end of the Wallowa Mountains. The boundaries of this district overlap those of the Cornucopia district, and rightly so, for the gold- bearing gravels of the Eagle Creek district were derived from the Cornucopia stock. Mining began in this district in the early 1860's when placers along Eagle Creek were worked. Those along Paddy Creek were worked also, but most of the gold production was from lodes and some was a byproduct of copper ore. The Sanger mine, the largest producer in the district, yielded an estimated $11/2 million in gold from auriferous quartz veins. The total early production of the district was estimated at $1,687,400 (about 82,000 ounces) in gold. Total recorded production from 1931 through 1951 was 5,782 ounces of lode gold and 69 ounces of placer gold; from 1952 through 1959, no production was recorded. GREENHORN DISTRICT: The Greenhorn district is between lat 44033' and 44044' N. and long 118025' and 118032' W. in Baker and Grant Counties. Both silver and gold veins were mined in the district before 1910. The Bonanza, the chief mine, produced $1 3/4 million in gold before 1904; it operated only sporadically from 1904 through 1916. After 1930 the bulk of production was from placers The total gold production of the district through 1959 was 89,200 ounces from lodes and 10,382 ounces from placers. LOWER BURNT RIVER VALLEY DISTRICT: The Lower Burnt River valley district, which includes Weatherby, Gold Hill, Durkee, Chicken Creek, and Pleasant Valley, is between lat 4417' and 44043' N. and long 117010' and 117041' W., along Burnt River in southern Baker County. The lode mines in this district were worked in the early 1880's, and the placers probably were worked earlier. Small production from the Weatherby area was maintained until 1955; however, most of the production was in early days, when no accurate records were kept. Some of the major lode mines were the Gold Ridge, Gleason, Little Bonanza, and Little Hill. Estimates of early lode production total $928,000 in gold (about 45,000 ounces). Total production for the district through 1959 was at least 50,000 ounces of lode gold and 3,500 ounces of placer gold. Production data for placers are reliable only for the period since 1932. MORMON BASIN DISTRICT: The Mormon Basin (Dixie Creek, Rye Valley, Malheur) district is between lat 44022' and 4431' N. and long 117023' and 11740' W. in southern Baker County and northern Malheur County. As early as 1863 placers were mined in the Rye Valley area and were credited with a production of $1 million in gold. Although quartz veins were known in the district in the early days, their gold production was not significant until after 1900; it was valued at about $21/4, million for the period 1906 to 1916. About half of this was from the Rainbow, the largest gold mine in the district, and, from 1913 to 1915, the most productive in the State. The district reported only small production from 1915 through 1948, and it was idle from 1949 through 1959. Total gold production through 1959 was about 177,500 ounces from lode mines and 56,200 ounces from placer workings. ROCK CREEK DISTRICT: The Rock Creek district is between lat 44049' and 45003' N. and long 118000' and 118015' W., 10-15 miles northwest of Baker. The district, discovered in the late 1880's, was a steady gold producer until 1914, after which activity declined; it was idle in 1959. The principal mine, the Baisley-Elkhorn, produced an estimated $950,000, chiefly in gold. Estimated early production of the district was $1 million, mostly in gold. Production from 1934 through 1959 totaled 3,282 ounces of lode gold and 193 ounces of placer gold. A conservative total for the district would be about 51,000 ounces of gold. SPARTA DISTRICT: The Sparta district is between lat 44036' and 44057' N. and long 117002' and 11723' W. Although placer deposits were known in the area at an early date, it was not until 1873, when the Sparta ditch was completed, that enough water was available to exploit the gravel-filled gulches which yielded about $157,000 in gold before 1900. Quartz veins were discovered a few years after the discovery of the placers, and from 1889 to 1892 they yielded $677,000 in gold. Shortly thereafter the district declined rapidly, and from 1952 through 1959 it was idle. Total production from the district through 1959 was about 35,200 ounces of lode gold and about 7,700 ounces of placer gold. SUMPTER DISTRICT: The Sumpter district, between lat 44037' and 4448' N. and long 11800' and 118018' W., is predominantly a placer district, but there has been a small gold production from quartz veins that cut argillite. Placer deposits were discovered here in 1862, and production was almost continuous until 1955. Records of production before 1932 have not been found, but from 1932 through 1955 the district produced 129,004 ounces of placer gold and 2,206 ounces of lode gold. No production was reported from 1955 through 1959. UPPER BURNT RIVER DISTRICT: The Upper Burnt River district, which includes Bridgeport, Bull Run, Unity, and Hereford, is in southern Baker County, between lat 44015' and 4436' N. and long 117035' and 11820' W. It is a large district and includes many localities that have produced small amounts of both placer and lode gold. Early production data are scant, but apparently some placers were worked before 1900. Total gold production through 1959 was about 9,300 ounces from all sources. VIRTUE DISTRICT: The Virtue district is between lat 44043' and 44057' N. and long 117022' and 117045' W. This is predominantly a lode district; placer operations consisted of small-scale diggings in some of the gulches below the veins. The Virtue mine, discovered in 1862, was one of the largest gold producers in eastern Oregon. Other mines in the district that have produced significant quantities of gold are the Brazos, Flagstaff, Hidden Treasure, and White Swan. The latest production reported from the district was in 1956. 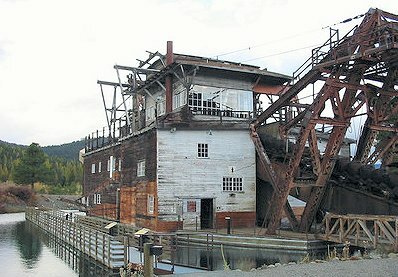 Early production of the district was about $2,500,000 in gold (about 121,000 ounces); about $2,200,000 came from the Virtue mine, which had its best years before 1900. Yearly production data for the district go back only to 1935. The total for the period 1935 through 1957 was 4,837 ounces from lode mines and 288 ounces from placers. Total gold production for the district through 1959 was about 126,000 ounces.